A guide to sources on the Barbary Wars, and the Marine Corps role in the Battle of Tripoli. 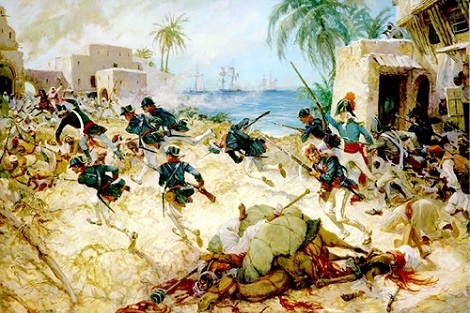 ”The Assault on Derna, Tripoli, 27 April 1805.” Artwork by Charles Waterhouse. With the Quasi-War with the French barely behind the United States, Yusef Caramanli, the Pasha of Tripoli, declared war on May 14, 1801. Over the next few years, corsairs from the Barbary states repeatedly attacked U.S. ships and extorted $2,000,000. During the blockade of Tripoli in October of 1803, the Philadelphia ran aground while chasing a corsair. The frigate was captured and the crew, including 44 Marines, were imprisoned. In 1805 Marine Lt. Presley N. O'Bannon and American consul William H. Eaton plotted with the Pasha's brother to overthrow the Pasha and free the crew of the Philadelphia. O'Bannon led 7 Marines, along with Eaton's mercenaries, on a 7-week, 600-mile trek across the desert to Derna (Tripoli). On April 26, 1805 O'Bannon, supported by three navy ships posted off shore, assualted the fortress and planted the American flag on its ramparts.